Is it worth the drive to get a massage at the spa? Reasons of why is better getting a massage at home instead at the spa. In today’s chaotic and hectic world, people more than ever need a relaxing massage but don’t have the extra time or energy to drive and get it at a spa or massage clinic. Between the frustrating daily commute, long work hours and family priorities, it’s getting more frustrating trying to unwind and relax. Yet, you try to squeeze some little time to get the massage you deserve. You are now ready to be on your way. How’s the weather? Rainy? Hot? Miserable? The stress of commuting to and from your appointment, wasting precious time you may not have, fighting through bad weather doesn’t make sense when the point is to relax! How’s the traffic? Hopefully you are not trapped in a traffic jam and arrive on time to the spa, or your time of the massage would be cut! Finally, you arrived on time but, don’t you feel rushed and hear the clock is always ticking when you are at the spa? Therapists are always rushing in fixing the tables, going to the restroom, reading your intake form, and you have to wait a few minutes laying on the table waiting for the therapist to come in and start giving you the massage. You are lucky if you get full 50 or 80 minutes of massage! On top of that, most of the popular massage frachises have a high turn over of massage therapists. As soon as you find a massage therapist you like, they’re gone. You are now finally getting a massage, but you can hear other people talking outside the room or the phones of the reception ringing. It’s very hard to relax with these noises. The massage ended but now you have to get dressed and be alert again because you have to drive and get stuck in traffic. So frustrating to cut the relaxation mode so drastically! Suddenly a trip to a day spa might not be as relaxing as it first seemed. Did you know that those interferences can often prevent or, even worse, reverse the benefits of a wonderful massage?! No traveling required! 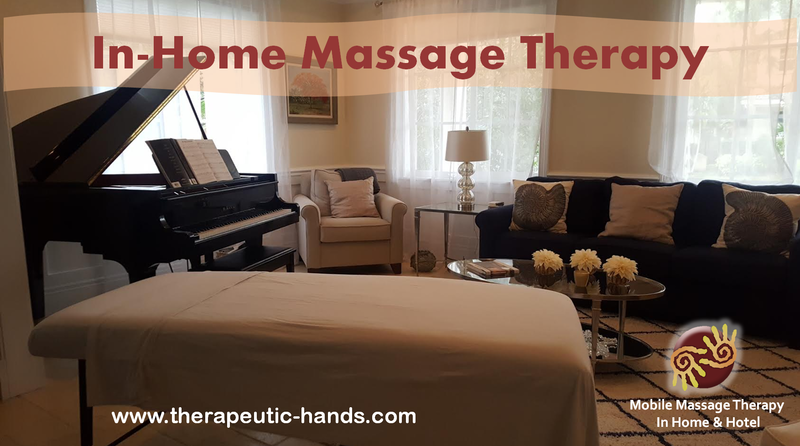 Enjoy the pleasure of staying in your own comfortable surroundings and holding onto the benefits of your massage longer without any outside interruptions. No miserable or dangerous weather you’ll have to risk driving through, no stressful traffic you have to deal with. Enjoy those extra minutes to relax at your place. You don’t have to listen people talking on hallways of the spa, phones ringing and getting dressed without taking a shower (most of day spas don’t have showers). Getting the full time of massage! Full 60, 90, 120 minutes of hands on! Getting regular massage treatments should be part of your normal health program. It should be viewed just like diet and exercise. This is something that you should do on a daily basis. It is important not to wait to you need a massage, but rather get one before the need arises.